The Future Circular Collider, henceforth referred to as Colossus, is currently projected to cost about 24 billion euros (about $27 billion dollars) TO BUILD. Maybe $38-40 billion to build AND operate. And you know how these things go. Projects like this almost always cost more than projected. I wouldn't be shocked if the final figure is on the order $50 BILLION or more dollars. All in pursuit of a gnome. http://jakobschwichtenberg.com/decentralization-science/ "The Value of Decentralization in Science". Here is the EU’s explanation for the rotation curves observed in galaxies. The mainstream insisted that observed rotation curves required dark matter, which as the video notes, they haven’t found despite 85 years and many billions of dollars trying to find. Doesn’t this make much more sense than the zoo of gnomes the mainstream has created out of thin air? When are the public (and other scientists) going to demand an end TO THIS COSTLY MADNESS of the mainstream? But a new study suggests that another phenomenon was perhaps more important in suppressing this type of star formation — the rapid growth of "halos" of dark matter, the mysterious stuff that makes up most of the material universe (and is so named because it neither absorbs nor reflects light). You just have to laugh at the statement “We don’t need that much physics to understand it”. Of course not ... not when you’ve got a ZOO of magical gnomes made out of whole cloth to work with. No physics needed at all. In fact, I'm not even sure you folks understand what physics is any more. When is this costly INSANITY going to end? When the big bang, dark matter, inflation, black hole, magnetic reconnection, etc. gnome believers finally ask for more than the welfare budget to do their *research*? Now this is VERY interesting … https://arxiv.org/abs/1901.03190 . That mainstream science article says they have identified two IDENTICAL LIGO events separated by FIVE DAYS. They claim this is just the result of “lensing” by an intervening galaxy … that there was only one binary black hole merger … but could it be an indication of a glitch in their detector/procedure? ... where whereas, as the paper states, "counter-rotating galaxies still represent a challenging subject for both [mainstream] theorists and observers”. And then Michael observes that the above is just MORE proof that the mainstream community’s ordinary mass estimates for the universe were TOTALLY botched ... and this would significantly impact the calculations that the mainstream used to claim that missing mass (i.e., dark matter) was needed to reproduce the rotation curves of galaxies in the first place. But you won’t find the mainstream going back and questioning whether it’s claim that dark matter was needed is valid. Because the mainstream has become a cult. In that thread, Michael also makes and proves the case “that EU/PC theory is 100 percent consistent and compatible with the standard model of particle physics, the single most tested and successful model in the history of particle physics.” Indeed, as he’s pointed out in the thread, the ONLY thing that the Large Hadron Collider (LHC) successfully did was confirm the existence of the Higgs boson particle … the one particle that was still missing according to the standard model. But the gnome believers have had to posit a different model … the LCDM model … to go along with their dark matter gnome. So billions of dollars have been spent looking for other hypothetical particles … and strings ... that the LCDM model posits . All without success. The LHC did not find ANY of them. Nor have any other experiments. So now the excuse is that the LHC just wasn’t big enough. The mainstream wants to build an even bigger, more expensive collider … not to confirm the standard model (because that is now complete) … but to prove the existence of the dark matter gnome and thus their LCDM model. But as Michael indicates ... it is destined to be money wasted … all because the mainstream community can not bring itself to admit that the calculations that led to the initial claim that dark matter is needed were DEEPLY FLAWED because of totally botched mass estimates. Enough is enough already. It's time to pull off the metaphysical band-aids and embrace empirical physical explanations for astronomical observations. Nothing can save the LCDM model from going down in empirical flames and everyone will get burned by that inevitable process. It's better to cut one's losses sooner rather than later. By the way, the entire linked thread (“Lambda-CDM - EU/PC Theory - Confirmation Bias”) at thunderbolts.info is quite informative, largely thanks to the work of Michael Mozina. And it demolishes the mainstream’s gnomish theories. Yes, a new gnome that I already mentioned earlier. 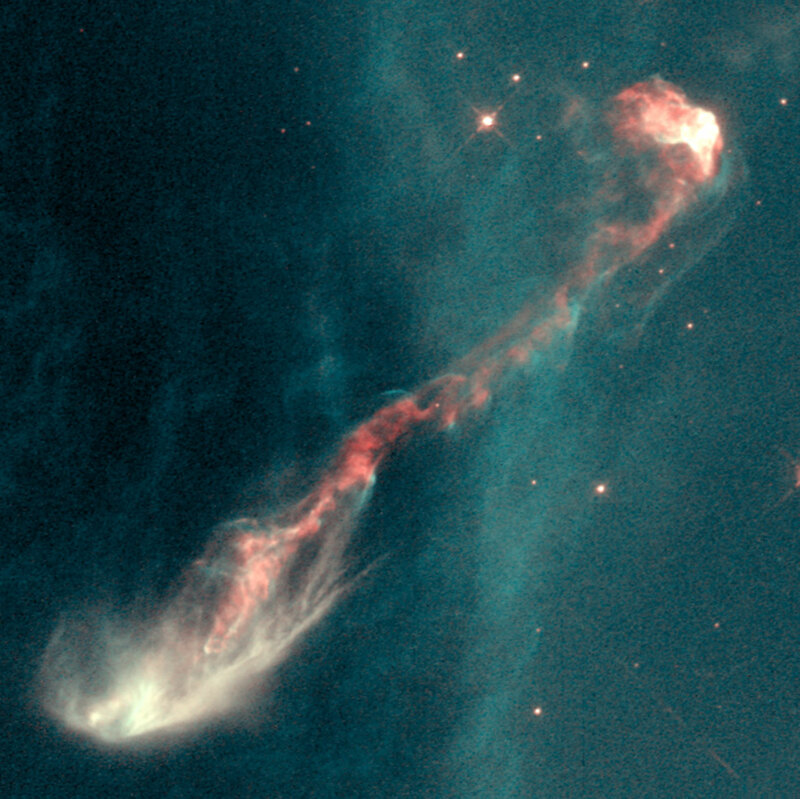 I know I’ve talked about Herbig Haro objects in the past on this thread, but every once in a while I like to revisit the subject, and perhaps add some new material. 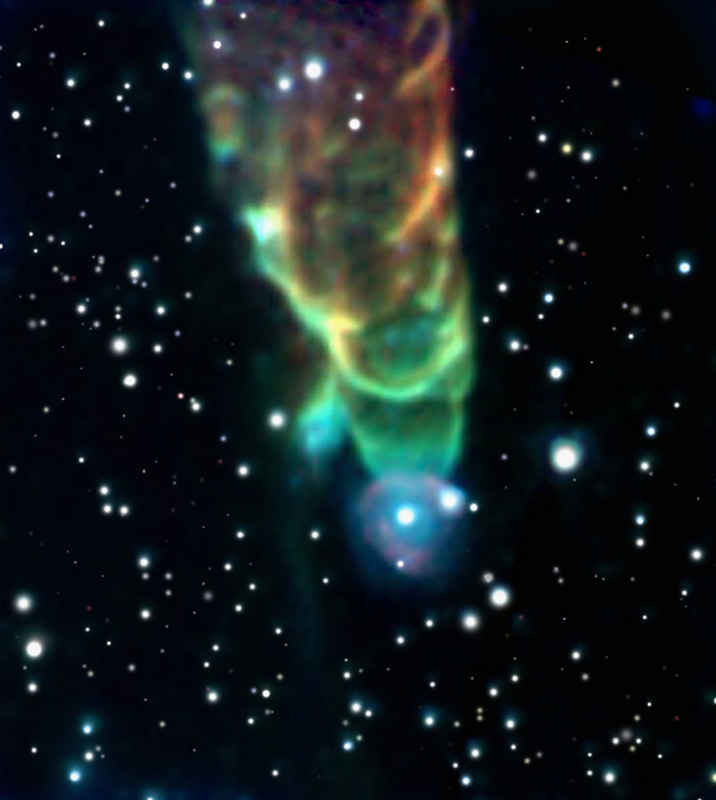 This is a double sided jet from a newborn stellar sized object inside the Orion B molecular cloud complex. The jet is thought to be oriented along the rotational axis of the star. Notice the helical winding of the jet, especially in the top portion. It’s quite apparent. Now, the mainstream doesn’t really understand what creates these jets. Their current theory is that as giant clouds of cool molecular hydrogen collapse under gravity to form a rotating, flattened disk encircling the newborn star, gas from the disk rains down onto the protostar. Superheated material then spills away and is shot outward from the star in opposite directions along the only uncluttered escape route – the star's rotation axis. Sometimes they don’t mention helical winding or even magnetic fields, sometimes they do, which leads me to suspect their *science* isn’t settled. NASA named this a pillar of “Gas and Dust” … but in truth it’s mostly plasma. And in this image, if you look carefully, you can see the jets from a least 2 Herbig Haro objects … one perpendicular to the very top of the cloud (HH901) and another even larger one (HH902) that is (coincidently?) perpendicular to the cloud about halfway down. This so-called “mountain” is likely filled with electrical activity if the EU/PC community is right. One does wonder why the two jets are roughly parallel. Doesn’t that seem an unlikely coincidence, in the mainstream model, and perhaps not so unlikely in a model positing large electric current moving through space causing the creation of stars (and galaxies) in preferential orientations? Notice the direction of the big sweeping bands of material outside the mountain? They seem to line up with the jets. Here are images of Herbig Haro object HH34, also in the Orion Nebula. 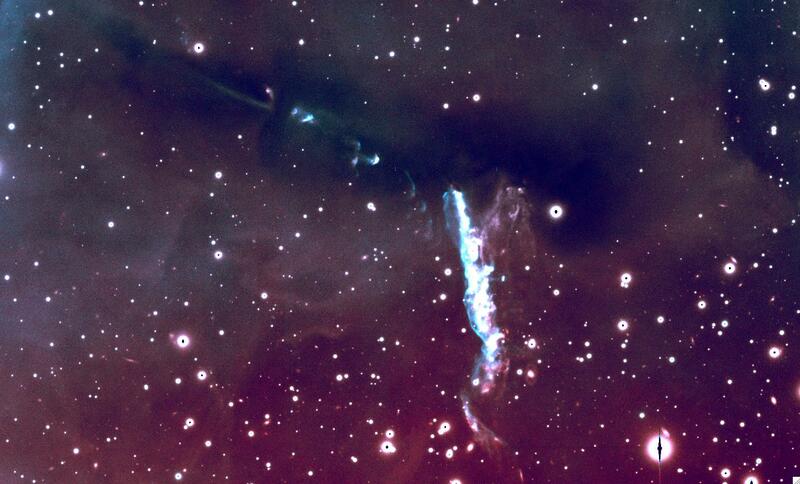 Again you can see there two jets on opposite sides of the protostar. The mainstream describes the jet structure as a machine-gun-like blast of "bullets" of dense gas. "Gas", not plasma, and the imagery the words paint again suggests they believe "explosions" are the cause. EU/PC theorists suggest those are similar to the discharge from focus fusion device (Lerner) or a homopolar motor (Alfven), both of which I’ve discussed previously. Maybe young protostars are doing the same thing? Again, there is clear helical winding in the jet coming from the protostar in the bright dust cloud on the left side of the image. But what if it is due to something as simple as the electric current in the jet, instead? HH110 is again helically wound. It’s a fundamental property that must be explained … and “explosions”, “shock” and “turbulence” just don’t do that. And I don’t think magnetic fields (more precisely, “field lines”) without a rational cause for them do either. What do you see? Helical winding … or as the NASA website ( https://apod.nasa.gov/apod/ap060203.html) says … a “cosmic tornado”. Look at the way NASA explained them ( http://hubblesite.org/news_release/news/1995-24 ) - “Stellar jets are analogous to giant lawn sprinklers. Whether a sprinkler whirls, pulses or oscillates, it offers insights into how its tiny mechanism works. Likewise stellar jets, billions or trillions of miles long offer some clues to what's happening close into the star at scales of only millions of miles, which are below even Hubble's ability to resolve detail” Lawn Sprinkers? LOL! This just shows how clueless the mainstream remains. And in that description, the words “plasma” and “electric” don’t occur even once. Instead, the “material falling onto the star creates a jet when some of it is heated and blasted along a path that follows the star's rotation axis, like an axle through a wheel.” “Heated and blasted”. LOL! Pray tell … what is *nozzle* in this explanation … the lawn sprinkler part? How does a star create a collimated jet that is trillions of miles of miles long by “heating” material near it? Hmmmmmmm? Notice that last part … “there is no direct evidence that magnetic fields are important.” They don’t seem to even try to keep the mechanism by which prostars and galaxies supposedly produce helically wound jets that are light years or hundreds of light years long consistent (although I find mainstream sources that do). Instead, the NASA site suggest the kinks along the path of motion are evidence for a stellar communion that “pulls on the central star, causing it to wobble, which in turn causes the jet to change directions, like shaking a garden hose”. 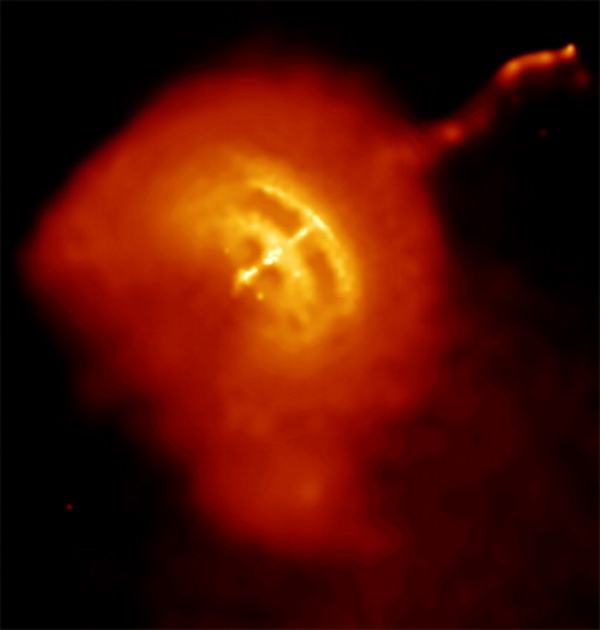 And by they way, here’s a 2011 article ( https://phys.org/news/2011-06-x-ray-puzzle-protostellar-jets.html ) that concludes the X-rays detected from these jets is indeed evidence of strong magnetic fields in protostar jets. What creates that magnetic field isn’t discussed. But as I said, there are sources that posit a magnetic field much like that imagined in the accretion disks of black holes powering the jet. Since in my last post I reviewed some stellar phenomena that might be best explained by EU/PC theory, let me continue in that vein. They are certainly beautiful aren't they? And they number in the thousands. 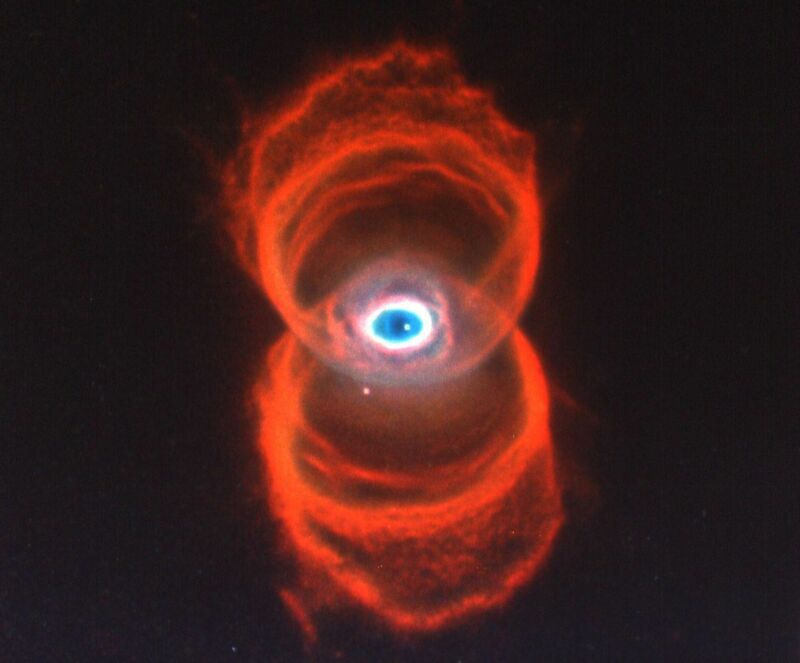 The mainstream calls them “bipolar planetary nebula” even though they have nothing to do with planets. Those are stars where the two halves of the nebula come together. The mainstream claims they occur when an aging low-mass star reaches the final stages of life, expands to become a red giant, then casts off the outer layers into space, slowly shrinking to form a white dwarf, while the expelled gas is slowly compressed and pushed outwards by stellar winds. The EU/PC community, on the other hand, sees those images and thinks of a stellar sized plasma filament (or more accurately, a bundle of filaments) carrying current through a region that has a z (or zeta) pinch, which has created a star. A z-pinch occurs when a current is run through a bundle of plasma filaments. The particles in the plasma are pulled toward each other by the Lorentz force. The contraction is counteracted by the increasing gas pressure of the plasma. The plasma will heat and begin to glow. In the lab, the crushing effect can produce an arc discharge between two or more layers of the structure. It is a well known property of plasma that it can operate in two visible modes (arc and glow) and one invisible mode (dark). In objects, like perhaps these stars, all of these modes are present. The outer, larger extent of the plasma filaments is very diffuse – the electric current density being insufficient to illuminate it (dark mode). As the filaments wind together and begin to interact, they begin to glow and in some places arc if a double layer occurs. Notice the bright ring surrounding the star in MyCn 18? That's thought to be plasma in arc mode. Bright rings are very common in these types of nebula when viewed axially. Look closely at the Garden Sprinkler nebula. Why is it s-shaped? And why are there obvious interwound twists in the plasma as you move away from the star? That’s again perplexing to the mainstream, who believe what they see comes from what is essentially a massive explosion. But the EU/PC community sees a twisting Birkeland current with braided filaments. And look at the internal structure within M2-9. It's problematic for the mainstream but in the laboratory, current-carrying plasmas naturally form cells separated by thin walls of opposite charge called double layers. Double layers will form along the current axis where positive charge will build up on one side and negative charge on the other side of a “sheath.” And if enough current is applied the sheath glows. EU/PC proponents ays signs of filaments, a z-pinch, double layers and glowing sheaths are visible in this nebula. And how in the world does a star, undergoing massive explosions, produce a bipolar formation anyway? Again, we encounter something that still puzzles the mainstream … that requires gnomes for them to explain. 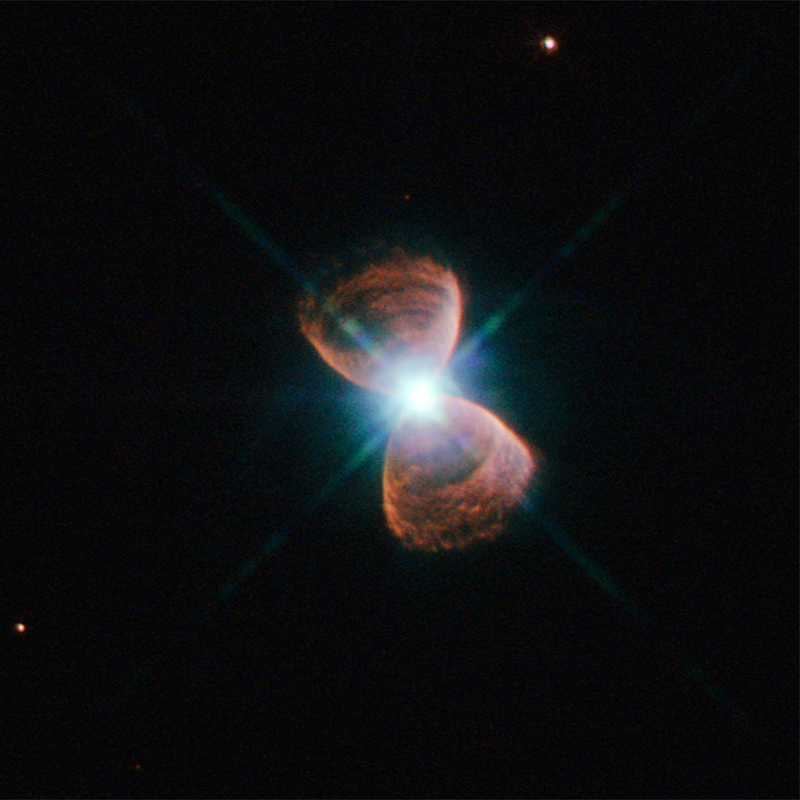 One gnome is that ( https://en.wikipedia.org/wiki/Mz_3#/media/File:Ant_Nebula.jpg) the central star has a closely orbiting companion that exerts strong gravitational tidal forces, which shape the outflowing gas. But astrophysicists admit that for that idea to work, the orbiting companion star would have to be very, very close … about the distance of the Earth from the Sun. Another gnome is that, as the dying star spins, its strong frozen-in magnetic fields are wound up into complex shapes. But in the EU/PC universe, bipolar forms along z-pinched filaments are not difficult to explain at all. They are a natural result of physics that can be demonstrated in the lab. The Boomerang nebula is peculiar too. 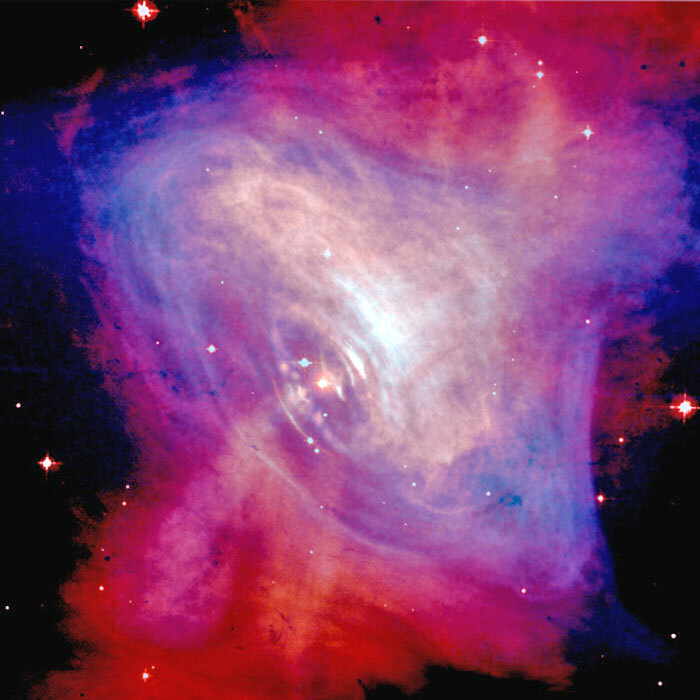 It is said to be a cold nebula … in one of the coldest places in the universe. In fact, radio measurements indicate the inner part is only one degree above absolute zero. 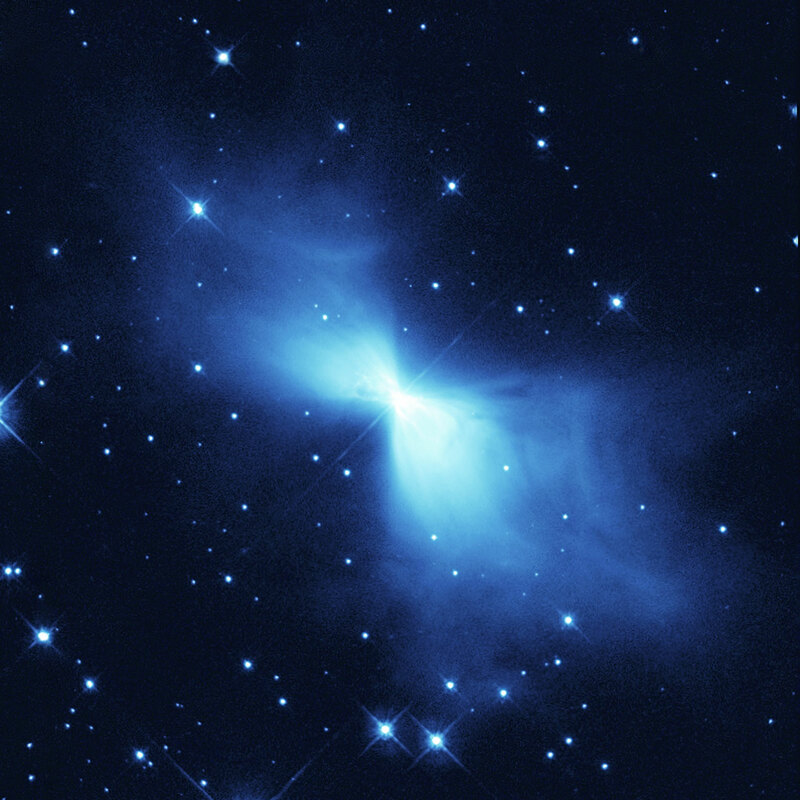 Again the mainstream uses gnomes to explain what they see ( https://www.universetoday.com/135920/finally-know-boomerang-nebula-colder-space/). They claim that collision with a binary companion is what caused the nebula and that rapid expansion of the gas from the “explosion” is the reason it’s so very cold. They say the only way to eject so much mass and at such extreme speeds is from the gravitational energy of two interacting stars. Probably not true. They just never think outside the box they've built around themselves. The mainstream just sees features it can't quite explain. The EU/PC community, on the other hand, notes the way the filaments spiral helically into and away from the central star. They say that’s a sure sign of Birkeland currents. A sign of electrical activity. But the mainstream won’t hear of it … won’t even consider this possibility. Perhaps because it’s not a gnome. Yet, it's something that can be modeled with physics we observe here on earth. It’s something that can be created in labs here on earth. Astronomers have used ESO's New Technology Telescope and the NASA/ESA Hubble Space Telescope to explore more than 100 planetary nebulae in the central bulge of our galaxy. They have found that butterfly-shaped members of this cosmic family tend to be mysteriously aligned — a surprising result given their different histories and varied properties. 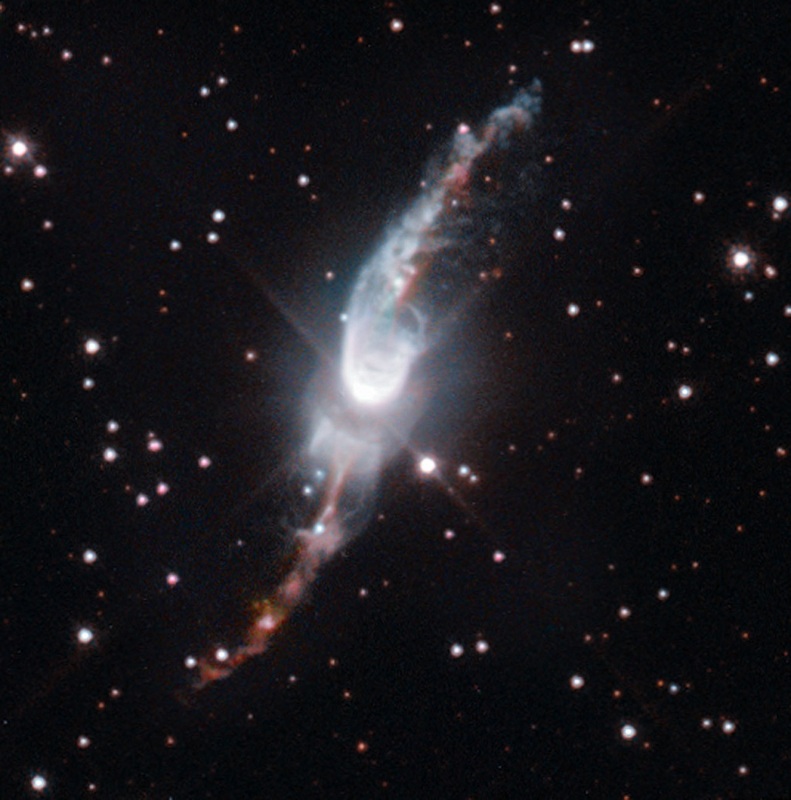 The final stages of life for a star like our Sun result in the star blowing its outer layers out into the surrounding space, forming objects known as planetary nebulae in a wide range of beautiful and striking shapes. 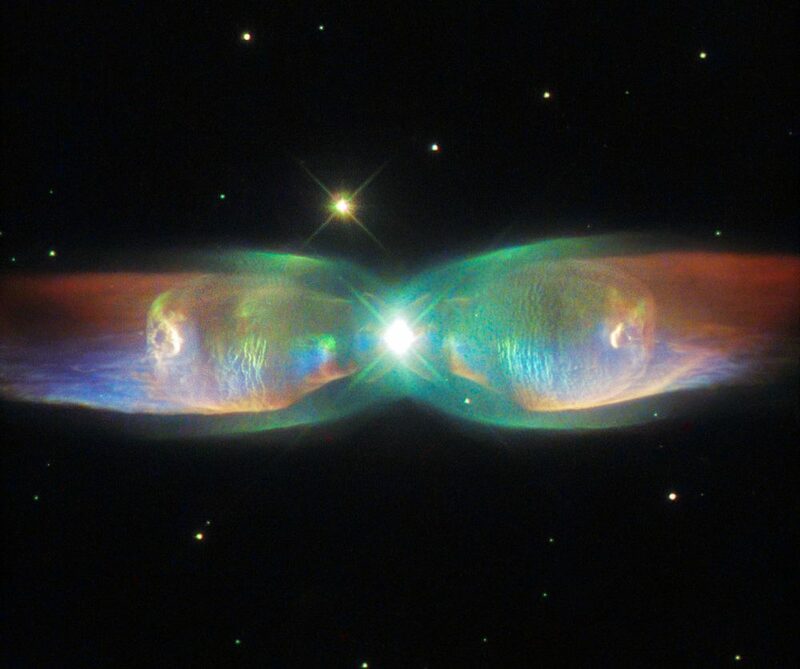 One type of such nebulae, known as bipolar planetary nebulae, create ghostly hourglass or butterfly shapes around their parent stars. All these nebulae formed in different places and have different characteristics. And neither the individual nebulae, nor the stars that formed them, would have interacted with other planetary nebulae. However, a new study by astronomers from the University of Manchester, UK, now shows surprising similarities between some of these nebulae: many of them line up in the sky in the same way . "This really is a surprising find and, if it holds true, a very important one," explains Bryan Rees of the University of Manchester, one of the paper's two authors. 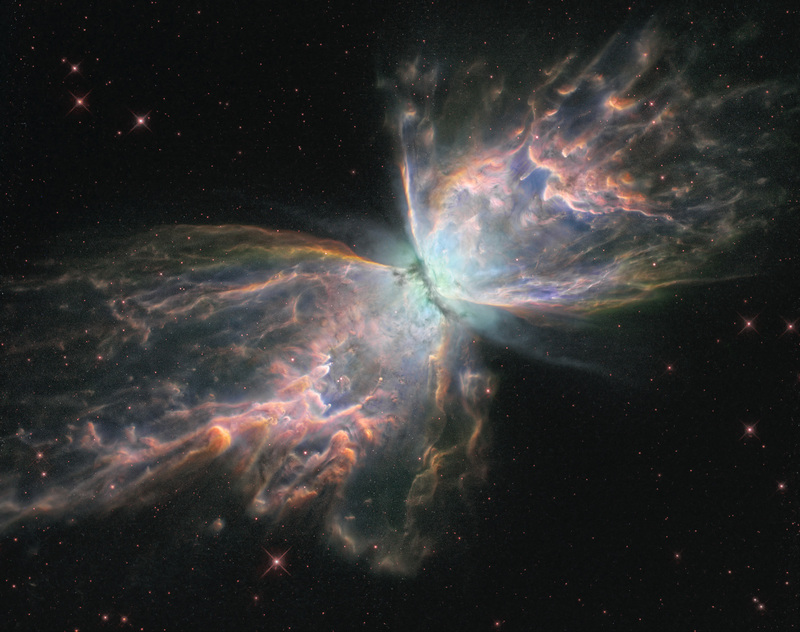 "Many of these ghostly butterflies appear to have their long axes aligned along the plane of our galaxy. By using images from both Hubble and the NTT we could get a really good view of these objects, so we could study them in great detail." The astronomers looked at 130 planetary nebulae in the Milky Way's central bulge. They identified three different types , and peered closely at their characteristics and appearance. "While two of these populations were completely randomly aligned in the sky, as expected, we found that the third — the bipolar nebulae — showed a surprising preference for a particular alignment," says the paper's second author Albert Zijlstra, also of the University of Manchester. "While any alignment at all is a surprise, to have it in the crowded central region of the galaxy is even more unexpected." Planetary nebulae are thought to be sculpted by the rotation of the star system from which they form. This is dependent on the properties of this system — for example, whether it is a binary , or has a number of planets orbiting it, both of which may greatly influence the form of the blown bubble. The shapes of bipolar nebulae are some of the most extreme, and are probably caused by jets blowing mass from the binary system perpendicular to the orbit. "The alignment we're seeing for these bipolar nebulae indicates something bizarre about star systems within the central bulge," explains Rees. "For them to line up in the way we see, the star systems that formed these nebulae would have to be rotating perpendicular to the interstellar clouds from which they formed, which is very strange." While the properties of their progenitor stars do shape these nebulae, this new finding hints at another more mysterious factor. Along with these complex stellar characteristics are those of our Milky Way; the whole central bulge rotates around the galactic centre. This bulge may have a greater influence than previously thought over our entire galaxy — via its magnetic fields. The astronomers suggest that the orderly behaviour of the planetary nebulae could have been caused by the presence of strong magnetic fields as the bulge formed. So ... instead of seeing what's obvious to the EU/PC community, the mainstream immediately turns to a gnome … “ancient frozen-in, galaxy wide, magnetic fields”. Oh, and by the way, after the mainstream discovered this problem … and tossed out that gnomish explanation … they promptly forgot the discovery … or ignored it. Since 2013, there have been no papers that I can find trying to explain what they found. It’s just another problem that they’ve swept under the rug. You see, folks, the explanation is staring the mainstream in the face ...it’s an electric universe. I don’t recall if I mentioned the European Space Agency’s $800 million dollar Euclid satellite which is now scheduled for launch in 2022. It’s primary goals are to study Dark Matter and Dark Energy … or the “dark universe”, as Bob Nichol, lead of the Euclid Consortium has said. Wikipedia states “Euclid will probe the history of the expansion of the universe and the formation of cosmic structures by measuring the redshift of galaxies”. 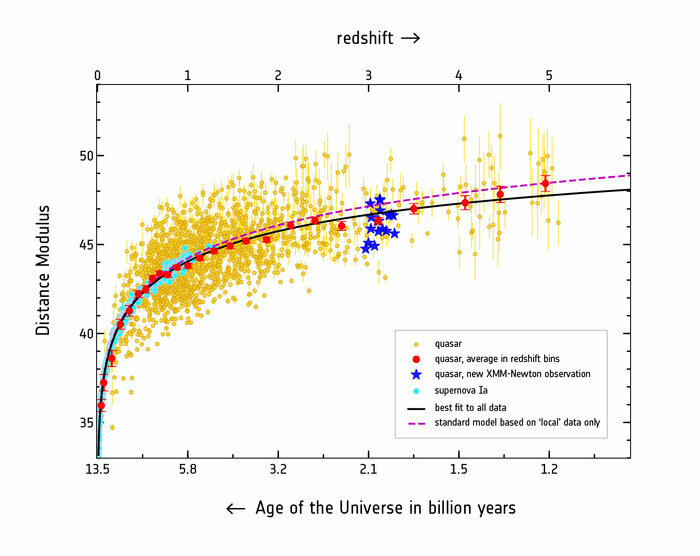 But this, of course, ASSUMES, that redshift is solely related to distance … WHICH IT IS NOT. In other words, when they tried to apply the mainstream's expansion/acceleration model to objects that are further away at higher redshifts, it didn't work right. So they need to come up with a fix. That’s right … ANOTHER gnome! Here's the deep, dark secret they are trying to keep away from the public. Photons in the lab have been documented to transfer some of their momentum to the plasma medium. That is the real cause of photon redshift over distance, not expansion. And since ALL of mainstream cosmology rests on the assumption that redshift is ONLY a function of distance, ALL of mainstream cosmology is a house of cards. Everywhere they turn, there is data that shows a huge problem in the use of redshift. Scientists have found the oldest, most distant galaxy yet: EGS8p7 appears to be a mere 600 million years younger than the universe itself. But according to current theories on the history of the universe, this galaxy shouldn’t even exist. Soon after researchers at Caltech spotted EGS8p7 using the Hubble and Spitzer Telescopes, they set about to determine its approximate age. This is done by examining the amount and spectrum of light radiated by the galaxy and comparing its “redshift” to those of other galaxies. Redshift is a distortion caused by distance akin to the Doppler effect, except it works on light instead of sound. 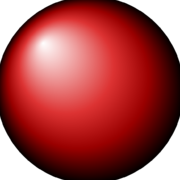 The further away an object is, the redder and dimmer its light appears to the observer. The researchers used a detection device called multi-object spectrometer for infrared exploration (MOSFIRE) to pick up the galaxy’s spectral signature. EGS8p7 has a redshift of 8.68, which makes it the most distant galaxy yet to be discovered. When we start dealing with exceptionally distant cosmic objects, light emission and age are linked by the speed of light and the time it takes for an object’s image to reach us across space. Based on this combination of data, this ancient galaxy is approximately 13.2 billion years old. It’s so far away that we’re looking at a snapshot of the galaxy from its infancy, as it first formed. This takes us back to a time in the universe’s first billion years when it was full of clouds of uncharged hydrogen atoms. A few hundred million years later, young galaxies heated up the hydrogen gas and gave it an electric charge. This boiling, ionized hydrogen created a spectral light signal called the Lyman-alpha line, and it is this signal that gave away the existence of EGS8p7. But the detection of this Lyman-alpha line is at odds with our current timeline for the universe. The galaxy’s redshift and age indicates that it created this light signature during a phase when there was no medium for light to travel through. 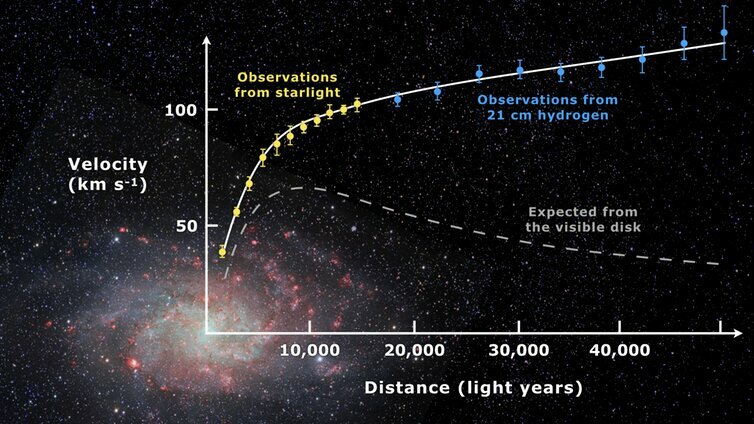 13.2 billion years ago, the universe’s hydrogen gas had yet to become ionized, and these thick clouds would have absorbed the photons making up EGS8p7’s light signal before they had a chance to travel across the light-years towards us. The researchers should not have picked up the signal at all. Astrophysicists are still fumbling to explain the galaxy’s spectral presence. The authors of the paper speculate that hydrogen ionization occurred in fits and bursts across the universe. EGS8p7 may have contained extraordinarily bright and powerful stars that released strong enough ultraviolet rays to ionize a bubble of hydrogen gas, allowing the galaxy’s light signature to propagate. Further analysis of the data will reveal whether this theory holds, or if astrophysicists need to rewrite their timeline for the infancy of the universe. But the mainstream just won’t listen. They’re too enamored with proving their gnomes. Because it's their *bread and butter* and they have little mouths to feed and wives to keep happy in nice houses. It’s Thursday and I see that the other group of *gravity only* *scientists are making their own new gnome ... space bubbles. Scientists have been searching for "dark matter" – an unknown and invisible substance thought to make up the vast majority of matter in the universe – for nearly a century. The reason for this persistence is that dark matter is needed to account for the fact that galaxies don't seem to obey the fundamental laws of physics. However, dark matter searches have remained unsuccessful. The velocities of the stars far from its centre were expected to decrease, as they experience less gravitational force. That's because, according to Newton's second law of motion, the gravitational pull on orbiting matter can be equated to a product of its mass and acceleration (which is related to velocity). While the first option seems very tempting, we haven't actually found any dark matter yet. Also, while gravity laws are well tested within the solar system, one has to be careful extrapolating this to scales which are at least one billion times larger. One well known attempt to get rid of the need for dark matter is Modified Newtonian Dynamics (MOND), which suggests that Newton's law of gravity becomes irregular when the gravitational pull is very weak – as is the case in the outer regions of the galaxy. But this theory, although successful in many respects, hasn't passed the same stringent tests as our standard model of cosmology, which includes dark matter. The main problem is that MOND cannot explain the missing mass problem in galaxies and galaxy clusters at the same time. Another very strong argument against MOND is based on the observation of colliding galaxy clusters, where the stars of each galaxy pass through each other, but the gas clouds stick together and stay behind. A famous example is the Bullet Cluster, which consists of two such colliding clusters. Observations suggest that dark matter follows the stars in these events, which have a lower total mass than the gas cloud. MOND cannot explain why that is. The surprising effect is that the size of the Newtonian bubble grows with the enclosed mass in a particular way. This means that the law of gravity changes at different length scales in galaxies and clusters of galaxies respectively and therefore it can explain the apparent dark matter in both systems simultaneously. That's not possible with MOND. Furthermore, it is consistent with the observation of the Bullet Cluster. That's because the gas clouds left behind in the collision are not compact enough to generate a sphere around them – meaning that the apparent dark matter is only notable around the more compact stars. MOND doesn't distinguish between stars and gas clouds. To our big surprise, our theory allowed us to explain the stellar velocities in galaxies a lot better than with Einstein's general relativity, which allows for dark matter to exist. So there may actually be less mysterious dark matter out there than we think – and maybe even none at all. It’s so sad … you have to laugh. Even a group of *alternative* gravity scientists can’t really think outside the box. Because they all went to the same *gravity only* schools. So none of them can imagine a universe where electricity is king. None of them can imagine that redshift doesn’t work as advertized. And if these folks prevailed against the vogue gravity-only theory, I’d be asking the same questions. And they’d be working hard to suppress the EU/PC opposition. So some things will never change. But at least they got one thing right ... they’ve been searching for dark matter for nearly a century … with no success. Yes. I was aware of that. Thanks for posting it here, even if it doesn't support the EU/PC thesis per se. Note that recently (2018), DARPA funded a project headed by McCullough to develop a quantum inertia engine. Which is instead of initials? Claimed signal might be due instead to helium leaking into the photomultiplier tubes. Over 20 years ago, a team running an underground experiment in Italy announced that it had detected evidence of dark matter—a claim the collaboration maintains to this day. But many physicists remain unconvinced that the signals detected were really due to dark matter, and outside experimental results have been mixed. A new paper in Nature reporting on results of a different, complementary experiment found nothing to support the controversial claim. And a draft paper posted to the online arXiv proposes an alternative hypothesis for what the Italian collaboration might really be seeing in their data. But neither paper is sufficient to put the matter to rest once and for all. What is the largest structure in the universe? Well the answer is 73 quasars. A multinational team of astronomers led by the University of Central Lancashire has detected a large group of quasars that may be the largest known structure in the Universe. Quasars are the nuclei of galaxies from the early days of the Universe that undergo brief periods of extremely high brightness that make them visible across huge distances. Astronomers know that quasars tend to group together in clumps of surprisingly large sizes, forming large quasar groups (LQGs). The newly discovered structure, named the Huge-LQG, is a group of 73 quasars located in the constellation Leo. It is so large that it would take a vehicle traveling at the speed of light some 4 billion years to cross it. According to the astronomers, the discovery also challenges the Cosmological Principle – the assumption that the Universe, when viewed at a sufficiently large scale, looks the same no matter where you are observing it from. The modern theory of cosmology is based on the work of Albert Einstein, and depends on the assumption of the Cosmological Principle. The Principle is assumed but has never been demonstrated observationally beyond reasonable doubt. To give some sense of scale, whole clusters of galaxies can be 2-3 Megaparsecs across, but LQGs can be 200 Megaparsecs or more across. Based on the Cosmological Principle and the modern theory of cosmology, calculations suggest that scientists should not be able to find a structure larger than 370 Megaparsecs. The Huge-LQG however has a typical dimension of 500 Megaparsecs. But because it is elongated, its longest dimension is 1200 Megaparsecs – some 1600 times larger than the distance from the Milky Way to Andromeda. “While it is difficult to fathom the scale of this LQG, we can say quite definitely it is the largest structure ever seen in the entire Universe. This is hugely exciting – not least because it runs counter to our current understanding of the scale of the Universe,” said Dr Roger Clowes of the University of Central Lancashire Jeremiah Horrocks Institute, lead author of the study accepted for publication in the Monthly Notices of the Royal Astronomical Society (arXiv.org version). More than 15 years after the first prediction of the CMB, its existence was confirmed by Dr. Arno Penzias and Dr. Robert Woodrow Wilson, who shared the 1978 Nobel Prize for Physics as a result. Since the real test of a scientific theory is whether or not it can make predictions which are later confirmed by the data, the existence of the CMB helped to solidify the Big Bang Theory as the commonly-accepted scientific model of the universe. While the existence of the CMB (if the “C” really belongs there) is definitely a confirmation of the Big Bang theory, there are also data that seem to contradict the theory. As mentioned above, for example, the cosmological principle is one of the fundamental assumptions used in the theory, but observations have always argued strongly against that principle. The CMB is no exception. Why does the CMB argue against the cosmological principle? Remember what the principle says. The universe should look the same everywhere, at least when we get to a large enough scale. Well, look at the image at the top of this post, which (ignoring the white curve and circle for a moment) is one way to represent the CMB in the observable universe (obviously a very large scale!). 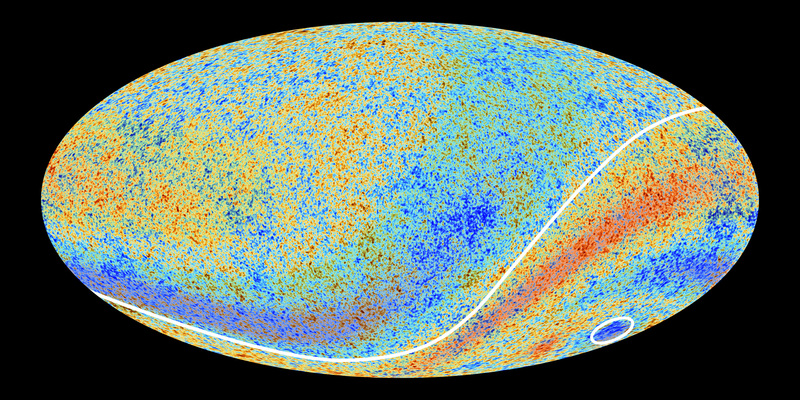 The red areas are parts of the universe in which the CMB is more energetic (on average), and the blue areas are parts of the universe where the CMB is less energetic (on average). If the cosmological principle were correct, the red and blue should be evenly distributed throughout the observable universe. Even the most untrained eye can see that they are not. In fact, there are at least two aspects of the image that seem to falsify the cosmological principle. First, the circled part of the image is huge, and it represents a part of the universe whose microwaves are ridiculously low in energy. It is generally referred to as the “CMB cold spot.” Worse yet, there is a universal trend in the microwave energy. The parts of the universe that are below the white curve in the image above have, on average, more energetic microwaves, while the parts of the universe above the curve have less energetic microwaves. That curve is called the “Axis of Evil,” and the cosmological principle says that shouldn’t exist. Now, of course, astrophysicists who are committed to the Big Bang model (or just the cosmological principle) aren’t willing to give up their precious preconceptions just because of some annoying data, so there are several attempts to “explain around” the CMB. Some think it is simply an anomaly related to the statistical analysis that is necessary to produce the image in the first place. Some think that the cold spot is a remnant of where another universe collided with ours. However, the fact remains that if the image above is an accurate representation of cosmic microwaves, the cosmological principle is simply wrong. There is one other big problem with the “Axis of Evil,” and it makes me doubt that the “C” should be in CMB. It turns out that the axis seems to be aligned with the very plane in which the planets of our solar system orbit the sun. There is absolutely no reason I can fathom that would explain why a universal phenomenon is linked to our solar system. However, I can image several reasons why something that is related to our solar system is linked to it. In other words, the Cosmic Background Radiation may not be cosmic.